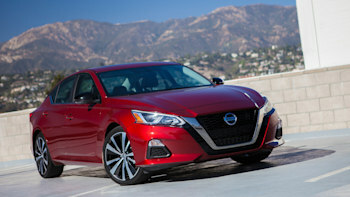 Nissan redesigned its Altima mid-size sedan for 2019, and families will find a lot to like about the new car’s backseat. It’s roomy enough to accommodate two car seats and its easy-access lower Latch anchors take the sting out of installation. Our test SV trim’s fixed head restraints did create some problems, however. Forward-facing convertible, grade A: We tested an SV trim with fixed head restraints, and the head restraint didn’t push the convertible seat’s back off of the seat (it should be flush with the seatback). Booster, grade C: The SV trim’s fixed head restraints pushed the booster off of the seatback a bit; it should be flush. The sedan also lost a grade for its floppy buckles, which will be difficult for kids to grasp and use independently.